The Americans with Disabilities Act (ADA) was passed in 1990. It requires business owners to modify their facilities to accommodate people with disabilities. This rule applies to building entrances, access to various services, and public areas such as restrooms. In fact, anyone can make their bathroom ADA compliant; it is as practical an upgrade as installing shower wall kits. Effective since January 26, 1992,1 the ADA has five titles. Title III establishes requirements for structural accessibility. The ADA Accessibility Guidelines2 (ADAAGs) provide a set of standards for modifications to existing buildings and for new construction. These are continually assessed and evaluated by the United States Access Board. Grab bars: These horizontal handrails are smooth but easy to grasp. Install them on any wall or partition closest to where an individual is. On the bathtub wall, surround the space with rails the person can support themselves with and hold on to. 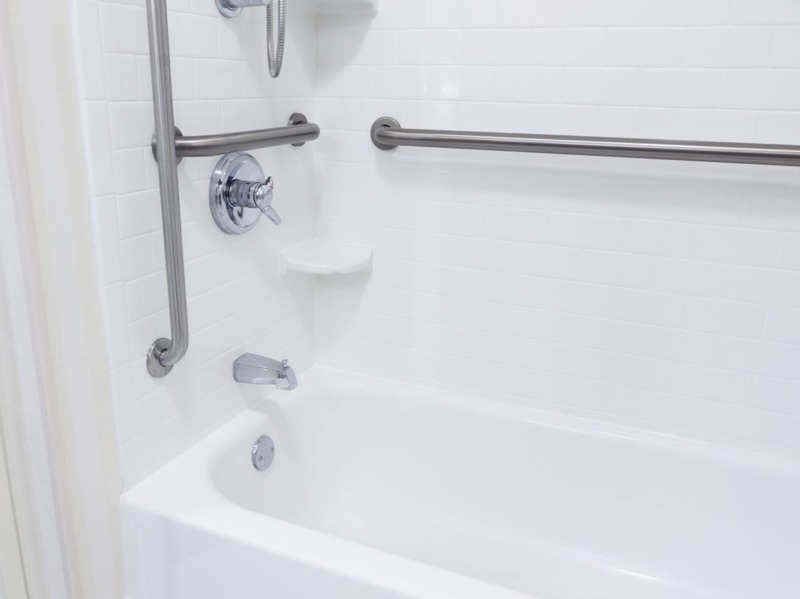 The optimal diameter is 1¼ to 1½ inches, while ADA grab bars should be 34 to 38 inches above the floor. Accessible toilets: An ADA-compliant toilet should be at least 60 inches wide and have a seat between 17 and 19 inches from the base of the unit to the seat top.3 In addition, there should be 16 to 18 inches of room between the unit’s center line and the side wall. This is something to think about in addition to where the bathtub wall panels will be. Ample room: There should be an open rectangular space of 30 by 48 inches around the sink, where the door can’t swing into. One should have 9 inches of vertical clearance for their feet, and 27 inches for the knees, according to the ADAAG. Properly sized sink: For shower enclosures, glass is a good choice, but sinks should be properly sized, at 34 inches high, so there is enough knee clearance to accommodate a wheelchair. Insulating or protecting the plumbing under the sink or countertop ensures the occupant’s movement is not interrupted. All faucets and knobs should be usable with one hand, while lever-operated, pushable, or electronically controlled devices can make things easier. Shower Seats: Whether you have tub shower units or one piece shower stalls, a seat should be installed. To meet ADA guidelines, this should be foldable and placed near the wall adjacent to the controls. The unit should support a force of 250 pounds. It can be rectangular or L-shaped; basically, whatever fits best within specific tub shower enclosures will do. An ADA-compliant bathroom must follow all guidelines for toilets, sinks, and configuration of bath enclosures. Rails on the bathtub walls are a requirement. These will make the space accessible and safe for any user. If you’re looking for modern corner shower stalls and shower enclosures glass enthusiasts prefer, we have what you need—and don’t forget about our ADA-compliant shower systems. Learn more about the ideal product for your ADA bathroom by calling us at 888-228-4925.